JT IRREGULARS: "Dalai Lama brings message of peace, nonviolence to Madison"
"Dalai Lama brings message of peace, nonviolence to Madison"
Tenzin Gyatso, the 14th Dalai Lama, speaks at the “World We Make” event, in the Capitol Theater at the Overture Center for the Arts in Madison. 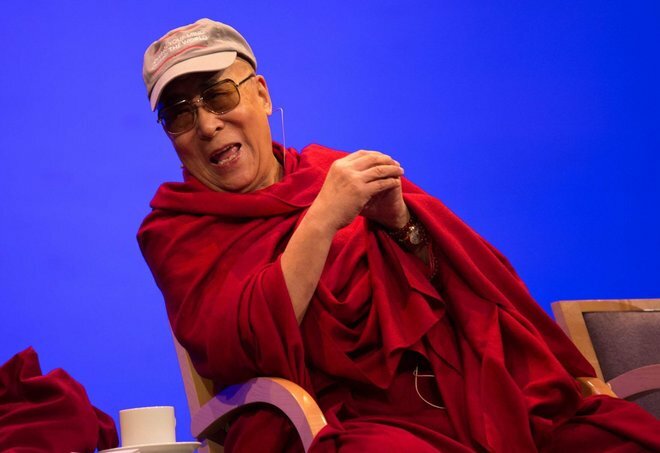 "'The 'World We Make' event, in the Capitol Theater at the Overture Center for the Arts, was the public highlight of the Tibetan Buddhist spiritual leader's 10th visit to Madison. "'It's practical,' he said, peering at the audience with the stage lights beating down. "'We can all have a positive dramatic impact on the world if we take seriously that we can train our mind to nurture these qualities,' Davidson said." He looks like he should have a cigar in his hand. Dalai Lama, Schmalai Lama. Leave the predicting to me and the peace-making to you.